Spend the weekend diving the beautiful Atlantic coast of Florida. Get ready to be pampered by the crew and captain while you enjoy the wonderful world of sea life under the water while aboard the charter boat. We have made arrangements with the charter operator to allow us to teach specialties from the dive boat. 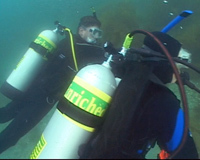 Students get to train while enjoying boat diving under the supervision of an instructor. If you do not want to do training, then come join us for some fun diving. 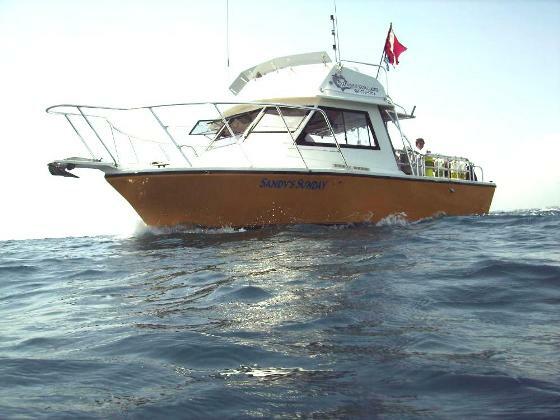 Dive Operator: We will be diving with Ocean Quest Scuba on their 30 ft Island Hopper dive boat named Sandy's Sunday. The minimum group size is 4 and the maximum group size is 10. Space fills up fast so contact us by email at or sign-up online so we can reserve space on the trip. Location: New Port Cove Marina in West Palm Beach, FL. West Palm Beach, FL is located on the Atlantic coast side of Florida approximately 2.5 hours (145 miles) Southeast of Orlando and approximately 3.5 hours (220 miles) Southeast of Tampa. Click here to download printable driving directions to New Port Cove Marina. Trip Dates: This dive charter is offered almost every month of the year. 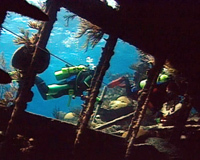 See our Dive Training Calendar or our Travel Page for our next dive trip. If you do not see a spear fishing trip scheduled, please contact us and we will setup a trip for you. 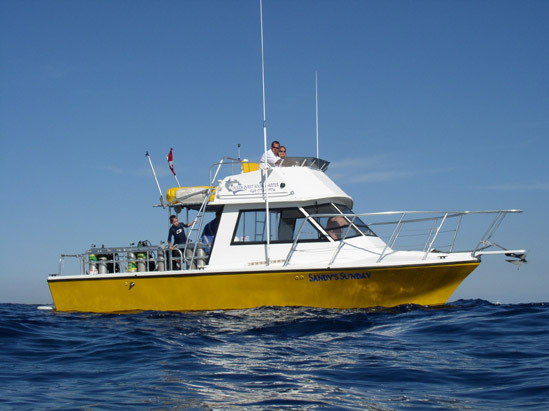 Save 10% ($12) if you sign-up for both the morning and afternoon dive trips. You should arrive at least 1/2 hour before departure time and unload your personal gear and complete release forms. On all dives there will be drinking water, soft drinks, snacks, fresh water rinse, shampoo & conditioner, defog, game coolers, customized spear gun racks, lobster snare racks are provided for your convenience. On ALL 3 tanks dives, a sub-sandwich, chips, snacks and soft drinks will be provided on the boat. The prices below DO NOT include crew tips, weights, tanks or personal dive equipment. If necessary, we can arrange equipment rental for you. However, we need to know what equipment you need to rent at the time of your reservation. Deposit: A 25% deposit of your total package (boat dives, rental gear) is required at the time of booking. The remaining trip balance (boat dives, rental gear) MUST be paid in full 15 days prior to trip date. Dive Training: We try to offer almost any specialty when diving from the boat. However, not all specialties are offered while diving on the boat. Look through the list of specialties we offer and pick the specialties you want to earn. Students may only perform 3 training dives in a single day. If you are interested in specialty training then contact us by email at or sign-up online so we make sure we bring the necessary equipment and materials to perform the dives. In order for the dive to count as dive one of the corresponding specialty or towards the Adventure Diver or Advanced Open Water Diver certifications, you must turn in the appropriate knowledge reviews from the Adventures in Diving Manual. Forms Required: Everyone will need to complete the Liability Release for Boat or Excursion form prior to entering the water. Students training will need to also complete the three (3) forms: Liability Release, Statement of Understanding, and Medical Statement prior to entering the water. Cancellation Policy: All cancellation notifications are required prior to departure date of the dive trip. International Trips - 70 day cancellation notice required for full refund minus the un-refundable deposit. Less than 70 day cancellation notice will be 50% refund minus the un-refundable deposit unless we fill the spot with another person. Space is limited and based upon availability. Prices may change without notice. How To Sign-Up: Space fills up fast so call us at (972) 467-8314 or contact us by email at or sign-up online so we can reserve your space on the trip.